La Sportiva is turning things upside down. This time, we are talking about ski walk/mode levers. The new Speedfire™ closure system incorporates a rear lever that latches at the top instead of the more-familiar bottom where it can become packed with snow when booting. The design goals remain the same as the original Spitfire: speed and performance. The former is accomplished through use of lightweight materials and one-motion transitions. The latter goal is met by incorporating carbon fiber reinforcements into the upper cuffs and stiff Ergal aluminum into the vertebrae. Sportiva also tacked on another goal: compatibility. 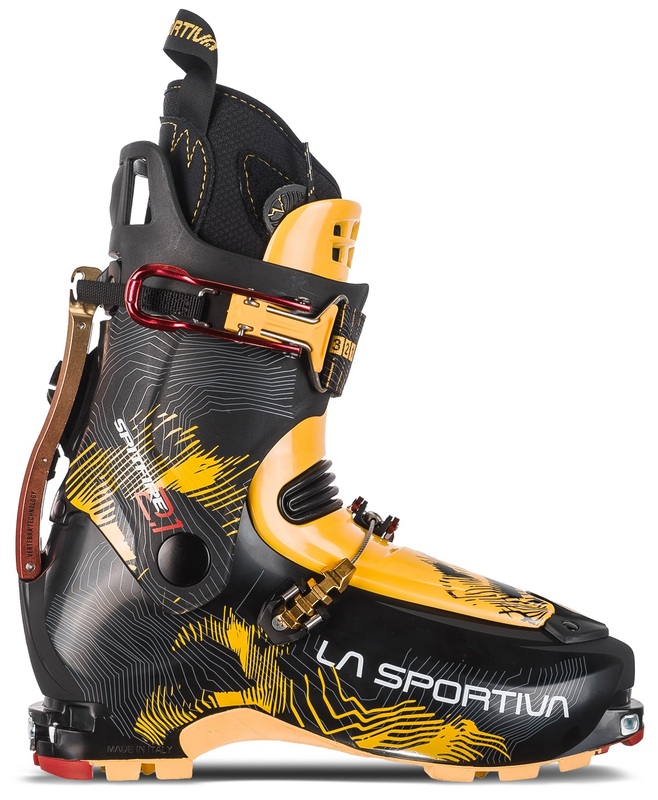 The Spitfire 2.0 is the first boot to work with step-in frame bindings, Dynafit-style tech bindings, and also the unique TR2 binding from Ski Trab. The result of all these goals is a truly special ski boot that meets the needs of similarly goal-oriented mountaineers. WarmSole™ inserts are an extra barrier between you and snow, good enough for cold days. Dual-density LazerGrip™ soles are extra tough in the toe and heel where abuse is highest. SPEEDfire Closure System™ is a one-motion transition and cuff adjustment mechanism. Forward lean can be adjusted amongst three different settings by changing the lock latch. CRP Cuff™ is a carbon-reinforced polymer upper shell that offers a smooth-yet-stiff flex. 3S Insert™ offers compatibility with tech and TR2 bindings, while deep welts fit into step-ins. 2BT Tech Last™ is a lower shell mold that offers an improved fit while being tech-compatible. 2BT Tech Heel™ is a volume minimizing shape in the heel to help prevent blistering. Slightly-less-rockered sole fits more crampons but still provides easy walking on rock. Cuffs allow for 68° of ankle articulation so there is nothing impeding the longest of gaits. G-Shell™ lower is a Grilamid mold that is light, stiff, and resistant to low temperatures. EZ Flex™ is a Grilamid tongue with flex spots to provide unrestricting walking and good skiing. Optional spoiler (+22g) and power strap (+22g) included if you want more beef for the descent. Pegasus buckles have been incorporated from the Spectre that are easy to use and fine tune. Skimo liners are thermo-moldable Paulau® with EZ Flex ankles for good fit and movement. Borrowed from high-altitude mountaineering boots, a patented lacing system has double tension. Update 2016/17: The Spitfire has a minor version number increase. The "2.1" has a re-designed upper buckle that makes it a bit easier to open and close. The rest of the boot remains awesome. Update 2017/18: Sportiva updated the color scheme and re-worked the instep buckle with a toothed design. Got these a couple of days ago. While I generally like them, I was surprised that they are quite narrow in the front. The claimed last width is 102, and they feel pretty tight in the walk mode. My downhill boots are 98 mm wide and I am very comfortable with them. I found a ski bootfitter who is still open in the area, and I am wondering if the shell and liner are heat moldable and can e stretched a bit. Thanks. Hi Scythian, yes the liners are heat moldable and the shell can be punched or stretched. Hey this is more of a fit review. My longest foot is 27.2 cm, other one is 26.5 cm, and I am "b" width with a narrow heel. A friend of mine had a pair of Spitfires at 307 mm to lend, so I borrowed them for a few weeks. Stock Palau liner which said 285 on it. With Smartwool light socks and a ski type off the shelf orthotic I was unable to keep my shorter foot's heel from slipping, even with everything cranked down as tight as possible. My shell fit was about 22 mm on the shorter foot, less on the longer foot. The longer foot did better, I think if both my feet were 27.2 cm the 307 mm might have worked. YMMV. I have wide feet and usually look for higher volume boots and I currently own a pair of Dynafit TLT 7--from what I've read out there the 7 is higher volume than the previous TLT. I do look at the last width for reference but that is dependent on fitting into the boot, and the overall design of the shell and liner. Is the volume roughly the same as the Spitfire/Sideral and upcoming Solar? Hey Roy! You are correct in that the TLT7 is a very different boot when compared to the previous TLT boots. I'd say that as far as the fit goes the Spitfire is probably closer to the previous TLT boots than it is to the TLT7. The Spitfire is on the low side of medium as far as the volume goes and in the forefoot is a bit narrower than the TLT7. I'd say through the midfoot the two boots are somewhat similar in terms of width. Fill out our boot fitter form if you'd like to get some more in-depth recommendations and feedback. I'm looking at getting a pair of La Sportiva Spitfires. I am wondering if the shell size changes on the even size 26, 27, ect. Or on the half 26.5, 27.5? It seems like I am seeing a lot of half sizes available. So question being is a 27 the same shell as a 26.5 or a 27.5? Hey Aaron, Spitfires sizing has the 26 and 26.5 as the same shell, 27 and 27.5 as the same shell, etc. Looks like you've sold out of certain sizes of the 2018 models, right? Will you be getting any more 2018 models? Hi Trevor, indeed we have. Please send your size to help@skimo.co and we'll get back to you with availability. Thanks! great. I'm a 10 in american sizes, and i think 28 mondo is right for me. 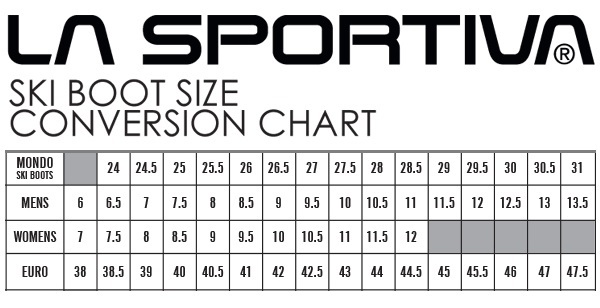 the la sportiva size chart matches 10 with 27.5. but i'd probably (without trying it on) be more interested in the 28. thanks. Hi Trevor, we have both shell sizes available. Based on just you shoe size, I'd go with the 27.5. If you have reason to believe you should go bigger, please visit our boot fitter. Last fall I was looking around for a superlight racing and touring boot that would fit my extra-sized feet (US 13/EU 47). JBo recommended these as an option to get as close to a true "race" boot as possible, and they haven't disappointed. I skied them around 45 days/100k vert last year, split about evenly between groomers and side/backcountry, and found very little to complain about. The ski/walk mechanism is extremely intuitive and easy to operate -- plus the "pop" that it makes when it snaps into place is very confidence-inspiring. After a couple dozen transitions I realized that it only took a firm ankle bend and a good push of the top buckle to put the boots into ski mode, which means the mechanism is pretty close to that of the Syborg in function if not in form. (Not to mention that the bar seems a lot more secure than a piece of wire, but that's a digression.) The forward articulation when skinning is great for a boot with an actual piece of plastic in the tongue, and it walks quite well. I was a little baffled by the forward lean at first (it seems pretty far forward, though I haven't skied in enough alpine boots to compare), but it only took a couple of days to get used to that. I'm sure there are a number of other facets of this boot that are working extremely well, so well in fact that my novice brain hasn't even noticed them. The Spitfires just seem to work well on the whole. I only give them four stars because there are a couple of odd features that could be ironed out.One is the interlocking of the strap and buckle and the wire gate which (I think) is meant to keep the strap from popping off when you switch to walk mode. This may have been fixed for the 2.1, but I find that gate to be pretty extraneous and non-functional. I bashed one on a tree during a particularly hairy losing-a-skin episode, and although it's easy to bend it back with a pair of pliers, was frustrated that the thing got in the way of transitioning until I took the time to bend it. My only other (admittedly minor) complaint was the forefoot buckle, which looks swanky and ultra-light but will also pop off when you switch into walk mode. That said, the screw mechanism is kind of genius, and will lock you down during steeper descents or loosen up for those long flat approaches. Many thanks to JBo for a great recommendation. I'll be skiing on these for many years to come. Hi TSB, thanks for the feedback. Note Sportiva streamlined the wire gate after the first release. We can send you some of the new ones, just give us a shout! Also...I wanted to come back and add a fitting note to my review now that I've spent a bit more time skiing and trying on different race-weight/near-race-weight boots, and started splitting my tour time between the Spitfire 2.0s (sz. 31.0) and Scarpa Alien 0.0s (sz. 30.0). If I were to buy the Spitfire again with similar fitting intentions (more of a "performance" fit for races/day tours, no concern for expeditions or horrendously cold subzero conditions), I would definitely go down to a 30.0-30.5. The 30.0 Syborg doesn't even fit over my navicular bone, but with the slightly wider last of the Spitfire I'd recommend other prospective racers with >30.0 feet size down a bit from what they think, or else you'll get a bit more slippage out of the heel box/through the instep. I have the first edition of the spitfire, Its been a great boot but have to fiddle with some of the straps at times. Have the upgrades addressed some of the issues from the first edition spitfire? Hi Barry, Sportiva completely redid the upper buckle and ski / walk mechanism. It's a stiffer boot and easy to operate. The optional power strap is simple Velcro and can be fiddly if you use it, but otherwise it's fairly refined. Is there an ideal way to attach a leash to this boot? My dynafit leashes are currently connected to the lower buckle on the inside. My problem is that having it on the inside may cause snags, especially if I leave the cable loop on when I'm cramponing in the boots. Also could be easy to lose the cable loop while buckling and unbuckling. If I move it to the outside it's even more losable, and I worry that any tug on the leash if ski releases, will open up the buckle and I'll lose the ski. Anyhow, is there a better spot for the leash than the lower buckle strap? Hey Thatcher, I think for a leash that short the best spot is the instep buckle. That being said, if you are really worried about it, the B&D Leash is long enough to wrap all the way around your lower leg. The B and D leash is the best one out there. Transitions are a breeze since you can leave it attached. Breakaway tabs can be added if you're really worried about getting rolled and want to be free of the ski anchors. I assume from your BSL measurements that these boots break on the whole size. i.e. will a 26 fit effectively the same as a 26.5? Maybe the smaller size will need a little more liner love. I wear a 26.5 in both Spectre and Syborg and really like them, but want something in between for big days and little skis. Hi Andy, yes the 26 and 26.5 are the same shell, and there is scant difference between them. After skiing or a mold, they are the same. These fit great on wide feet for a lightweight boot! I've got a lot of miles on my 1st generation Spectres which had to be punched for my knobby feet significantly. The Spitfire 2.0s required none of that so far (but may in one spot. I'll see after a bit more use). I was maxing out the reach of the lower buckle until the liners formed a bit. Looks like they'd fit much narrower foot without issues. The stiffness on the downhill feels about even with my TLT 5 Carbon boots (with the tongue in) but significantly more progressive. They tour comparable to the PDG but walk much better do to the rocker shape I guess. Finally, La Sportiva is crushing everyone with the sole rubber compounds they're using. The Spectres are suction cups on the rocks and the Spitfire 2.0 are damn close. Of note here is that the 2.0s don't have as much coverage nor is the rubber as thick as the Spectre. It's a lightweight boot so I didn't expect nor did I want that. - The new ski/walk mode has a quirk. if there is much tension on the big aluminum bar which makes it work, the boot won't come out of ski mode all the way or will temporarily pop back into ski mode while walking. This is happening under my softshell pants which do not have an abundance of space for ski boots. - The "screw" which holds the lower buckle onto the scafo should be a real screw so I can shift things around or add longer buckle for my fat feet. That's it. Love the things. One follow up to the review. One of the screws which hold the lower buckle in place was seized up. The other 3 released after heated up a bit with a soldering iron. Difference between spitfire and sideral? I know the spitfire is a little lighter and perhaps a little more race oriented but does it feel different than the sideral fit wise. Does it ski better than the sideral. I want to do 1 or 2 races per year but use this boot as a light weight touring boot and for spring conditions. Hi Chad, the Spitfire 2.0 has a new ski/walk mechanism and has carbon in the cuff which combined ends up being noticeably stiffer than the Sideral 2.0. So yes, it does ski better for most folks. Any thoughts on how these fit compared to the Spectres? I'm wondering about width and volume as well as length...Thanks! Hi Jeremy, we won't have a perfect feel until the production models are in our hands in a couple weeks. They are spec'd slightly slimmer than the Spectres, and are probably a touch shorter as well. so are these slimmer than the previous spitfire, width wise? Is there a posted forefoot width last? Well, they aren't any wider than the Spitfire 1.0, and not as wide as the Spectre. They seem a touch lower volume than the previous version.